If you didn’t find much to gasp at during the iPhone OS 3.0 section of Monday’s keynote presentation at Apple’s Worldwide Developer Conference, that’s understandable. Much of what was showed off were features that we saw trotted out back at March’s iPhone special event where Apple initially introduced the software update. That said, we did get a glimpse at a few brand new iPhone capabilities as well as a more detailed look at some of the features that were only hinted at three months ago. Let’s take a look at what’s coming to our iPhone when the update drops on June 17. As rumored, the iPhone’s iTunes Store took a step in the direction of parity with its desktop sibling by adding the ability to purchase and rent movies, TV shows, music videos, and audiobooks from inside the phone’s iTunes app. As with podcasts, music, and apps, any content that’s over 10MB will only be available to download via Wi-Fi, and not via the iPhone’s cellular connection. Apple’s also made content available from iTunes U, the store’s educational section with classes and lectures from schools around the world. In addition, the iTunes application will now support users logging into one or more different iTunes accounts, and even let you create accounts directly on the phone. Previously, the iTunes app on the phone pulled its account information from whatever account was logged in on the computer that you were syncing with. Apple also showed off a few additions to the iPhone’s parental controls section, most notably the ability for parents to restrict what applications their children can use. This also requires that all developers submit an age-rating for their applications, as Apple senior vice president Scott Forstall later said. The App Store has received a lot of criticism for its issues with its approval process, including some apps that have been banned as a result of objectionable content, even in cases where the content was similar to that being sold elsewhere in the iTunes Store. Enabling restrictions on applications and forcing developers to rate their apps could be a way for Apple to absolve itself from some of the responsibility of policing for edgier content. AutoFill was briefly mentioned in Apple's iPhone presentation back in March, but this was the first time we got a glimpse—albeit a brief one—at what it’s capable of. As in Safari on the desktop, not only can AutoFill remember the usernames and passwords for your Web sites, but it can also populate contact information fields on forms based on the information you’ve entered in your phone. Apple took a little more time to talk about tethering, the ability to share your iPhone’s cellular data connection with your Mac or PC. While the company didn’t show us anything about how the feature works, it did say that a number of their partners in different countries would be offering the feature, though AT&T was notably absent. (A spokesperson from AT&T later told Macworld that the feature would arrive, though they did not say when or how much it would cost). Apple did, however, say that the tethering capability would work with Macs and PCs and could be used over either USB or Bluetooth. Perhaps the most ahhh-inducing unseen feature of iPhone 3.0 was the newly-unveiled Find My iPhone service. 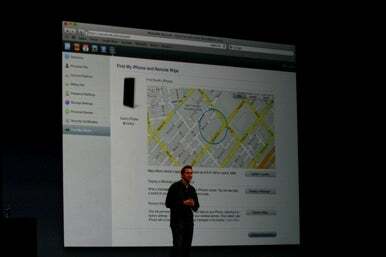 Available only to MobileMe subscribers, Find My iPhone allows you to locate your handset should you misplace it. You access the service via MobileMe’s Web interface, at which point you have several options. Firstly, the Web page can tell you the location of your iPhone, using the unit’s built-in location services, letting you know if you left your phone in the movie theater last night, or in the back of that cab. 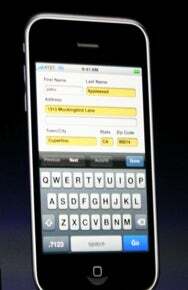 You can also send a message to your iPhone, along with an alert sound that plays even if the phone’s ringer is off. This can help in situations where the GPS location doesn’t: for example, if you’ve misplaced the iPhone somewhere in your house. The chime can be played repeatedly, enabling you to easily track down the phone. Finally, if the phone is lost for good, or contains sensitive information, you can also opt to remotely wipe all data from your phone: contacts, mail, music, photos, etc. And of course, should you then locate your phone, all you need to do is plug your iPhone back into your computer, and you can restore from the latest backup. The iPhone OS already supported almost 20 languages in iPhone 2.0—iPhone 3.0 expands that number to about 30, including long-awaited support for right-to-left languages like Hebrew and Arabic. Apple also noted the inclusion of Thai, Greek, and Korean, and noted that every keyboard has both landscape and portrait orientations. The “s” is for software? Along with its speedy new hardware, the iPhone 3G S also brings with it a variety of new software features. While these features are included in the iPhone OS 3.0 update, they’re only available to iPhone 3G S users. The 3G S adds new camera features, including auto-focus, auto-exposure, and auto-white-balancing, all of which works in tandem the the 3G S’s new camera. There’s also a tap-to-focus feature that lets you select which part of a scene you want to focus on. In addition, the camera can also shoot video, which you’re able to trim using a built in filmstrip view very similar to that of iMovie ’09. Once you’ve trimmed the clip, you can easily share it over e-mail, MMS, or upload it to YouTube or your MobileMe gallery. The iPhone 3G S also adds Voice Control, a speech-recognition feature that lets you control common actions such as calling contacts and playing music just by speaking into the iPhone’s microphone or the unit’s headphone mic. Hold down the Home button to summon the Voice Control interface, and you can tell it to dial your friend by name, by number, or play music by track, artist, or playlist—you can even tell it to start playing a Genius playlist. In addition to the Voice Control feature, Apple also talked about adding new accessibility features to the iPhone 3G S, such as Voice Over, zooming in on text, displaying a high-contrast white-on-black display, outputting mono audio, and more. Voice Over, in particular, features a number of specialized gestures to control different functions of the phone. However, the accessibility features are available only on the 3G S.
Apple also added support for Nike + to the iPhone 3G S, allowing you to use the Nike + iPod Sensor in conjunction with a new application to track your progress while running, and sync that data to iTunes for future use, just as you can with the Nike + iPod Sports Kit. Finally, the iPhone 3G S also includes a new digital compass. Not only does it allow you to orient yourself using a compass interface (which also provides longitute and latitude), but you can also use the compass in the Maps program to show you which way you’re facing, and even orient the map corrently to help following directions easier.